In the last month I really kicked it out working on Tami’s Round Robin quilt. The colors: Orange, green, black, beige, white (grey), yellow. Here is what I believe is Tami’s original center block – forgive me if I missed a small border here. As you can see, very asymmetric, several colors going on, and YES textures & tucks. So much inspiration from this piece – and from Tina & from Daisy who had the quilt before me. The little green triangle things are sticking out from the fabric center, there are mock cathedral window things on the right hand side, and I don’t know what it’s called with the tucks that are sewn down flat that migrate in and out on the grey-white piece on the bottom. The interplay of the fact that – hey – I have never made a quilt in this color pallet before – not really – the green / yellow / orange color pallet together is an interesting and inspiring combination for me. I have started a whole fabric folding pinterest page in preparation for making my portion of this quilt. I got really excited because several of my own batiks could be used in the making of this quilt too. This was a few of the initial ideas I had for this quilt. The instructions for this round were to use the focus fabric in this round. Tami had a plethora of fabrics and colors and textures of her own for this quilt. Her focus fabric I took to be the dark fabric with the large wide red/green/orange flowers on it. There was already a strip of the focus fabric in the quilt in another twilter’s round. But this focus fabric really took my ideas and directed them. I think I tweeted Tami about 15 times the first 2 weeks with different ideas and techniques I wanted to do with her quilt. But then trying to figure out how to play out this bigger print was giving me a little more thinking than I planned. I tried one folded fabric very cool applique technique while sewing at my friend’s house. It was moderately successful, it could have worked, and if I hadn’t gone another direction. And then I thought about weaving fabric with even a different technique I saw with a new book. That idea lasted for a while, but if I wanted to do weaving, it would have to be with a specific side, and I couldn’t get the focus fabric in that idea either. There were several possible techniques and books to draw info from these techniques from. I kept looking back and forth one of these books specifically. Where I finally got my direction from with my section of the quilt. The book is Machine Stitched Cathedral Windows by by Shelley Swanland. I was intrigued by several different patterns in the book, I tried to make the design from a general quilt to a border style. So I read & figured out what Shelley was describing. It took reading & rereading and finally a light-bulb clicked on and it made sense. Unfortunately, there was an error / typo in this printing of her book, and staring at the corner pieces, looking at the required pieces to make this border the way I was considering was a little confusing. I did get her FB page, and she sent me her email and we had a few lovely chats about the corner pieces. In the meantime, while waiting for one of the emails in the email tag, I figured out the error in the foundation pieces and tried it, and sure enough, I got the thing to work. And, this will come as no surprise to you if you know me, but she said that only maybe a handful of people even tried the isometric grid that I was working on. (A grid based off of 60 & 30 degree pieces — ie hexagons and equilateral triangles). So that made me feel swell. And then I was drawing out color schemes for the pieces, and then as I was coloring the diagrams in preparation for sewing, I decided that the edges didn’t really need to be all the way windowed as they would just be this impossible to see pieces with the dark focus fabric. So I asked for her help, but didn’t need it anyway. It was sure nice to chat with Shelley anyway. I did – and still do – plan to get a picture tutorial of how I worked on her pieces however, But since there are elements on this quilt that I am not going to show you yet, I will wait to work that out. And in the meantime, I started forming a vision. I did another drawing. And then slowly the pieces started falling into place. One idea made another, made another and another. And before I knew it, I had a really really wide border on one side. Of dark focus fabric. I stretched this over to the top to make it a modified “L” color scheme – which had already been done with the previous two rounds of the quilt. Oh I wish I could show you all the colors here. A quick too close up view of a corner should be good. I tied the oranges back to the left side (already heavy on the right), the black, dark on the left, I wanted the light green from the original block to show back up on the right side. But the left side was big. So one border is 12 inches, and the other is like 2 or 3. I pulled yellow on three of my four sides to mellow it all out some. I repeated elements of 3 on 3 of the four sides. 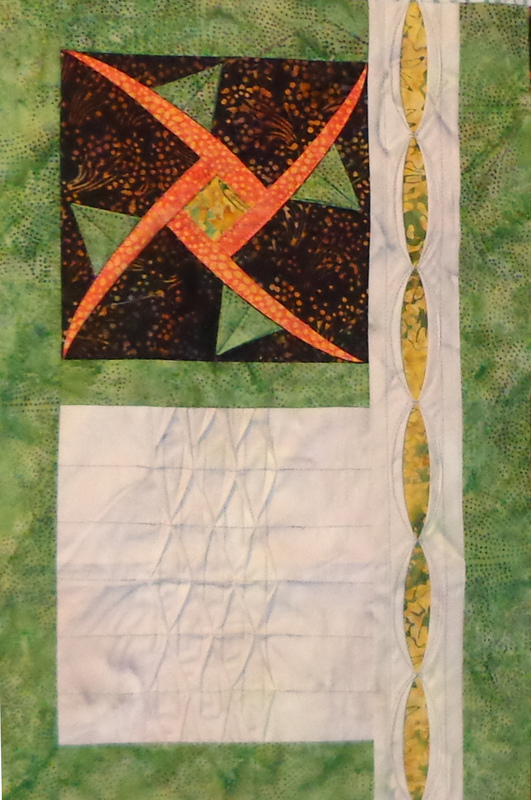 I did put the isometric grid pieces in the quilt, but appliqued them as separate elements. I also machine appliqued three other pieces down that I was originally just going to keep – throw-offs from mistakes in making the bottom side. I had just set them down on the top of the quilt to get them out of my way, and they grew on me, and I threw them on the quilt too. Whoo! There are lots of pieces. One design element was when I had ran out of focus fabric that was precut & I didn’t want to cut any more, so I added extra color And I like that happy mistake too. Some of my fabrics threw elements of purple and elements of red that are not highly present in the fabrics that Tami sent. But they work. The work as a whole, remains balanced in color (in my opinion) I also honored the general flow of clockwise that started of in the middle that was carried on by the previous two Round Robin twilters. And yes the previous cross-section shows elements of the other twilters’ pieces of the round robin. I don’t even want to say how many elements I have in this quilt. About 20. Ish. Now for the journal, and then figuring out how to stuff this back into the box. Let me preface this post first and foremost in saying this is not meant to complain about my round robin experience. Just in case you get the wrong idea later. One of the BEST things about quilting is the differences you meet in styles. I have yet to ‘really ever use’ a focus fabric, much less several, in determining a quilting color relationship. Perhaps this makes my quilting color choices less successful than others. Tina has 2 different but very similar focus fabrics. She included wonderful fabrics in her round robin box in addition to the focus fabrics. A light yellow, a light pink, an olive green/brown tinted fabric, and the focus fabrics. Daisy, being the first recipient of the round robin included a fabric that has a hint of grey. The original block was a cute little paper piecing/applique (in portions) of a sewing machine, and a project being quilted. Daisy added a border (no spoilers except for the fabric had a hint of grey). And my task is to add about a 4 inch pieced border that matches & frames the quilt so far. These fabrics are so much fun, but they are just slightly different than the fabrics that I have in my stash. I have been picking & pulling fabric off of my shelf, putting them next to Tina’s box, her start of her quilt, and her chosen fabrics. Tina’s fabrics are great, but I am finding it a challenge and a blast to see if I can add to the quilt with fabrics of my own. And yes, I know it did turn out well in the end. I trusted myself enough for that, and I did make a finish on my portion and I am so in love with it so far. What I love about this project is that even if my fabrics are more saturated than Tina’s, that I can either find fabrics I own that match her style, or I can purchase a few other pieces to match the fabrics in this quilt project as well. Here is the first small snippet. It’s been very fun trying to match & compare the colors of what I have, seeing what concessions could be made, seeing how subtle the differences in olive green can be. I have been playing around a version of borders from Judy Laquidara’s border book. It’s larger than the specified pieced border, but it is very Darla-like. And very symmetrical. So I am using it. I am dreaming of windows when thinking of this border. Like what you would look through when sewing. I had another idea, but this one kept coming back to me. Windows. Is a generic hint about the border. Here is some of my sketch made this morning trying to fit everything together. VERY small snippet here, too much farther away gives the border away. I decided to make the darker color grey to tie in with Daisy’s border instead of going with the dark brown suggested by the focus fabrics. But it’s the right shade of grey. It’s very dark, but the darkness is pretty narrow. I used all 3 values in this border, and I had to repeat a motif in the middle of the top & bottom borders to get it to fit exactly. Here’s an in-progress shot from this afternoon. Also a very small snippet. I started off this AM thinking of putting animals through the windows, not knowing when I would work on it. But today I decided to move on against the idea of animals, I got the whole border is completed today, not wanting to make any more decisions on this portion of the quilt. Progress helped along with a great audiobook in the background. Now I just have to finish writing in the journal. And send it off when ready. I can’t believe I am ready early. I am SO ready to be done with the 1 month due-dates and to slip back to the 2 month due-dates. Now that we are caught up with the 5 person group, that will happen. But then it will be put off until 2 weeks to go as well, because that’s how it is with me. I mistakenly thought this was going to be a short, quick, easy round, and I do like what I did, and it was basically done in one day, but there are a lot of pieces here and so now back to my other projects. The lots of pieces are a main reason I decided to skip the animals, there is already SO much to look at on my round. Sorry I can’t show much more here. I do hope Tina will like it and that it doesn’t detract the eyes too far away from the other parts. I may send along the dark grey fabric to help complete the quilt, but first I need to make absolutely sure I don’t need it in another project or that I can get my hands on more of it easily in case I do.